I'm Not A Dragon's Mate! 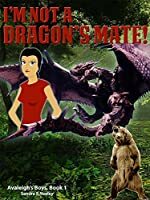 >> Sandra R. Neeley I'm Not A Dragon's Mate! – I'm Not A Dragon's Mate! Title: I'm Not A Dragon's Mate! About " Sandra R. Neeley "
This is my first book by this author, but it won t be my last The story starts out dark, but the MC keeping fighting I loved the family dynamics, it shows you can make your own family and there was a lot of love and hope I look forward to reading of the series. First book I have read by this author I enjoyed the characters It was a bit creepy at the beginning but it had to be there Great read.